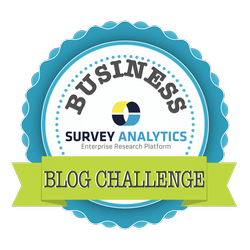 SurveyAnalytics Blog: Day 30: Where Does Your Business Stand Today, And Where Do You Hope To Be a Year From Today? This is a fitting end to the Business Blog Challenge in which we have been sharing all kinds of valuable content to our readers for the entire past month. So, where does Survey Analytics stand today? Survey Analytics stands in a deep focus of listening to our loyal customers and doing a better job of making sure all of our features are working at 110% and continually enhanced upon. Assuring overall customer success across the board is always becoming an increasingly important subject and we have experienced great customer retention rates. We have received our share of both good and bad feedback as we have worked day in and out to continue improving and pushing the envelope. Today, we are all about really helping you and forming long-term partnerships that last. In terms of an organization we have been internally reworking some of our processes to maximize both organization and efficiency of the many tasks at hand for our small SaaS business. Just a year plus a few months back since I have started working here, so many things have really changed for the good. We have had some great off site and out-of-the-norm management summits to get our team together to focus, align and launch what’s next. We have really learned a lot in the past year as an organization, and we have grown our team and processes significantly. Meet some of our newest team members Anup Surendran as Product Manager, Dan Fleetwood as Customer Success Manager, Melissa Ridgley as Marketing Coordinator and Colin Wong as Sales and Marketing Manager for the APAC region. We are also seeking to add a full time Public Relations Manager within the upcoming months. With our software this past year we experienced an early and shaky launch of our mobile capabilities on iOS 7 and how it impacted us is now something we have championed and improved significantly upon. This year so far we have rolled out a few new things as well, such as improvements to our conjoint capabilities, panel management software and our mobile survey SDK. We have a couple of new sections on our blog called Feature Spotlight and Product Release to keep you in tune with what we have going on in terms of our development and what’s new. We also have made big enhancements to all of our apps across the board and even launched some new ones: The LifeMetrix app for passive data collection and FlashLet for revolutionizing employee feedback and internal communication, which can be used online or through the app to make sure there are no gaps in responses from your team. Just two days ago on Saturday we put out a great post of all of our existing apps today and how they can be utilized to improve your feedback processes or capture a new wave of actionable insights. Surveys are really just one piece of the puzzle when it comes to listening and collecting feedback. With that in mind, our focus and place we want to stand in the next year is as a leader in the mobile space as it becomes a more validated method for collecting real-time data. Although e-mail is still popularly used as the main communication channel within businesses (internally), we have seen e-mail slowly dying as the best way to access respondents to surveys. With that in mind, we are also going to be providing more value through integration and utilizing APIs to other popularly used sales and marketing platforms we already have integrated with like Salesforce.com and Google Analytics. An API with the popularly used marketing tool, ExactTarget is also in progress. We provide an API to communicate and send calls with any software out there that our target market desires to customize, centralize and draw more action from their collected information. In addition, in the next year we also are looking to work with more app developers to install our SDK to customize feedback initiatives in already existing or about to launch mobile apps. Thanks for reading the final day 30 post of our Business Blog Challenge! We hope you enjoyed reading over the past 30 days as we shared some great content about our brand, vision and the tools that help our business grow.